A few weeks ago some friends and I planned a swimming excursion to what turned out to be one of the best swimming holes I’ve found so far in Taiwan. The small peaceful lake next to Hsinchu’s Touqian river (頭前溪) with its deep pool and crystal-clear jade coloured water was the perfect solution to the extremely warm September that we’ve had here in Taiwan this year. Celestial Lake (仙湖), which I blogged about a few weeks ago turned out to be one of my favourite finds of the summer. It is situated in the beautiful Atayal Indigenous village of Wufeng (五峰) which is an area of Hsinchu that I haven’t spent a lot of time exploring - but have quite a few locations on my list of places to visit. On my first trip to the lake I decided to make the most of my time and include one of Wufeng’s other tourist locations in my travel itinerary - Guyan Waterfall (谷燕瀑布). The reason why I decided to make a stop over at the waterfall was actually quite simple - It was just a short hike away from the bridge that connects you to the entrance for the lake so stopping by wouldn’t take a whole lot of time away from swimming. The path to Guyan Waterfall is clearly marked and it is easy to park a car or a scooter along the road for the five-ten minute hike to the falls. If you don’t feel like taking the hike to the base of the falls however you can still enjoy the beauty of the large falls from the road. I recommend taking the short hike though so that you can get up close and personal to this waterfall. The falls, which are a short hike up a path marked with hiking flags is easily accessible and if you want to take a dip in the pool below, it is quite easy to do so. The pool however isn’t deep enough for a real swim, but why would you want to have a swim in the frigid mountain water when the beautiful Celestial Lake is so close? The view of the falls from the base is quite nice and from the top you also get a nice view of the road and river below which make the hike worthwhile. Don’t be lazy, if you’re in the area just hike up and check it out. Then go for a swim in the lake below. 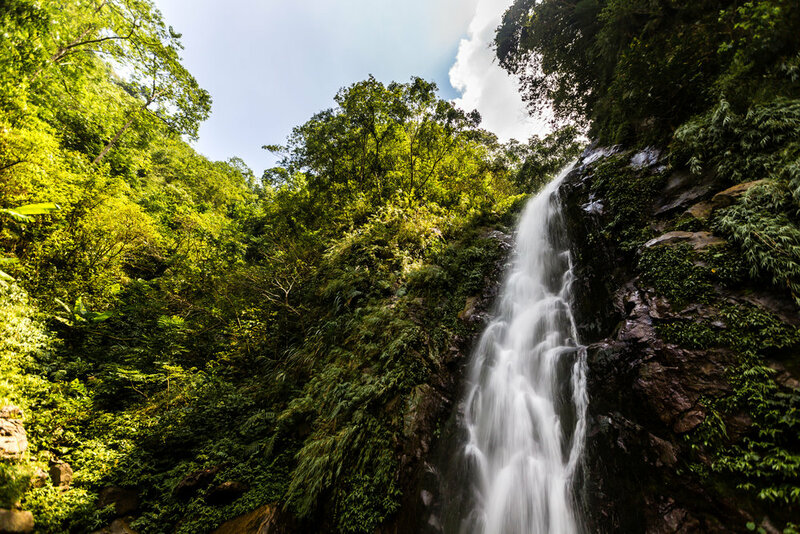 Getting to the waterfall is quite easy - Just follow County Road #122 (縣道122) from Jhudong (竹東) and when you reach Wufeng Village (五峰鄉) switch to County Road #63 (縣道63) which is also known as Luoping Road (羅平道路) and once you cross over Heping Bridge (和平橋) you have arrived. I’m including a map above which should help visitors locate the waterfall but you can also check out Follow Xiaofei’s blog post about the same waterfall which offers a much more detailed map and directions on how to get to the waterfall.